In 1971 Lamborghini unveiled the latest in mid-engined super-cars, the Countach. Clothed in the incredibly sleek, aerodynamically shaped coupe body was a V-12 engine with enough power to produce a maximum speed of 290Km/hr, faster than any other production road car. 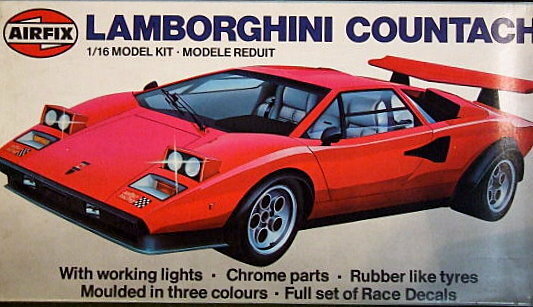 As a 1:16th scale construction kit, the Countach makes an impressive subject as this detailed example will testify. It has working lights, rubber-like tyres, three-colour moldings for ease of painting, chrome parts and a full set of colourful decals. The completed model has a length of 256mm and added extras include opening doors, bonnet and boot.